Description: NO MAGAZINE SALES into NEW YORK CITY. CONNECTICUT residents must furnish us a copy of your CT Eligibility Permit or ammunition certificate. This listing is for ONE MAGAZINE. Buy 3, or combine any 3 non gun non ammo items, and shipping is Free for the entire order, lower 48. Here are factory Walther Magazines to fit the popular SW99 Pistols that are a joint effort of Smith & Wesson and Walther. They are also identical to magazines issued in Walther models 990 and 990-L; and more recently in the Magnum Research MR Eagle Fast Action pistols chambered in .40 Smith & Wesson Caliber. Each magazine is actually manufactured by Mec-Gar of Italy and so marked; and that puts these factory Walther and S&W Magazines in the class with all the best magazines in the world. 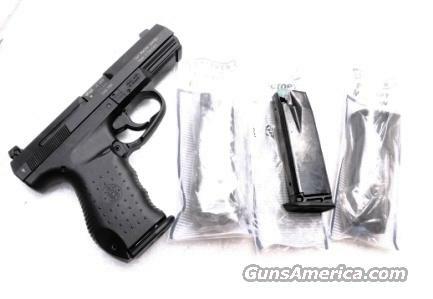 Importer on these was Walther Arms, a recently divested arm of Smith & Wesson. The reason we got these at a good price is, that the Smith & Wesson wing in Springfield MA and Houlton ME is giving way to Walther USA in Fort Smith AR. Smith & Wesson Factory number is 19279; Walther number is 2796503; and Magnum Research number is FA4010. Some magazines may have the Smith & Wesson name on them, but they are the exact same magazine, whether they bear a Walther Banner or S&W logo. Manufacturer Mec Gar is the principal magazine supplier for Beretta, Browning, Kel-Tec, and Sig Arms, and wisely so. Their magazines are solid steel construction, superior springs, followers and floorplates. They free-fall eject like they’re supposed to; they lock the slide open when they’re dry like they’re supposed to, and most important, they work reliably. Construction is smooth finished blue steel bodies with steel springs. Cartridge followers are high impact black, red, or blue polymer, with slightly extended black polymer floorplates so that each magazine holds only 10 rounds of .40 Smith & Wesson or .357 Sig caliber ammunition. Buyers in jurisdictions where 12 rounders are permissible, Please see our ads for excellent condition SW99 / 99QA S&W 19358 magazines. Replacement pricing ranges upwards of $50. We’re offering the mags in the photos, however, or their identical mates, each	for only	$ 24.00. Buy 3, ships Free! Not for sale to residents of New York City. Any magazine deliveries into New York City require written permission from the Police Commissioner, so we cannot ship magazines into any of the five boroughs or 176 some odd zip codes, per NYC Code 10-131.10. Connecticut buyers must furnish us a copy of your State Issued Eligibility Permit or Ammunition Certificate, per P.A. 13-220. Any ammunition, firearms, or personnel showing in any of our photos are NOT included.